A 31 year old lady mountain biking with her partner, came off on a jump. and landed heavily, aggravating an injury she had suffered some weeks previously. 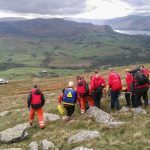 A member of Cockermouth MRT was on scene and requested assistance. The Team set off with two vehicles full of personnel, and others went direct. The casualty was in considerable pain, and the Team Doctor administered some powerful analgesia before she was packaged in a vacuum mattress. She was then carried up to a waiting NWAS ambulance, where she was assessed by the crew, and then transferred to the Cumberland Infirmary for treatment.